Whoever said prevention is better than cure, could well have been talking about mosquitoes. Today, everyone is concerned about a mosquito-borne virus called Zika, a rare tropical disease which has now been found in countries in The Americas, including the Caribbean. The virus is being associated with birth defects; and although that link is still unconfirmed, women who are pregnant or planning to become pregnant, are warned to be particularly vigilant. All communities must approach this matter seriously and aggressively, recognizing that the most effective way to control Zika, is to eliminate mosquitoes. Here are some important steps to take immediately. Start now to clean up your surroundings. Get rid of all mosquito breeding areas by avoiding the build-up of rubbish. Put garbage in closed containers. Clear gutters and drains and remove stagnant water. Remove coconut shells, old tyres, old appliances – anything that could contain standing water. Cover all water tanks. Clear your surroundings of bush, tall grass, old bricks and construction materials; those are all places were mosquitoes could hide. To further reduce your risk of being bitten, use insect repellent that contains DEET; wear loose, light-colored clothing that covers your arms and legs; and sleep under a mosquito net. Mount a massive prevention campaign to protect yourself, your family and your community. Keep Zika out of your life. Public health authorities in the Caribbean are working diligently to mitigate the effects of the Zika virus. Zika, also known as ZIKV, is spread primarily by the Aedes aegypti mosquito. 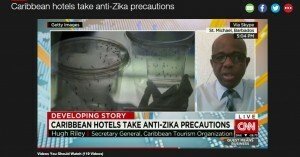 The public-sector-led Caribbean Tourism Organization (CTO) and its private sector counterpart, the Caribbean Hotel and Tourism Association (CHTA) are in close contact with the Caribbean Public Health Agency (CARPHA) to monitor and research the Zika cases that have now surfaced in some Caribbean destinations, and to communicate prevention and control measures to residents and visitors. The CTO and CHTA are in communication with their respective stakeholders and are observing national, regional and international health protocols in dealing with mosquito-borne viral diseases which can be found in tropical countries. With more than 700 islands in 30 territories in the Caribbean, conditions will vary from one nation to another. CTO and CHTA will continue to monitor all developments related to mosquito-borne viral diseases and to support appropriate communication, education and prevention initiatives. The Caribbean is the one of the most tourism dependent regions in the world, thus travel related diseases like Zika have the huge potential to negatively affect the economies and tourism destination reputation of Caribbean countries. In fact, according to our partners, the Caribbean Tourism Organization (CTO) and Caribbean Hotel and Tourism association (CHTA), there are already reports of travel cancellations in the Caribbean due Zika. While Tourism related travel is the Caribbean’s major economic earner, it also contributes to disease spread. The Caribbean Tourism Organization (CTO) indicated a record 26.3 million stay over tourists and 24.5M cruise ship arrivals in 2014, a 5.3 percent rise over 2013, and this trend continued in 2015. These visitors spent US$29.2 billion, another record for Caribbean tourism. The US continues to be the region’s primary market, with nearly 13 million Americans, just under half of the total arrivals to the region. However, high and increasing levels of visitor arrivals increase the potential risk for visitors and locals transmitting or acquiring diseases from each other. This was typified by SARs in 2000, the H1N1 pandemic of 2009, Chikungunya in 2013 and now Zika. Thus, heightened concern, alerts and specific measures for travelers have resulted from regional and international health agencies like CARPHA, PAHO, WHO and CDC. The consequences of reduced tourist numbers for the millions of people in the Caribbean whose livelihoods depend on the sector can be serious, contributing to adverse economic and social burden on Caribbean economies. As travel increases, the number of Zika cases among travelers will likely increase and the potential negative impact on Caribbean tourism –dependent economies will likely escalate. In May 2015, the first local transmission of Zika virus was reported in South America. To date, no locally transmitted Zika cases have been reported in continental United States, but cases have been reported in returning travelers. Local spread of the virus in the US can stem from imported cases as Aedes vectors are present in some states. Consequently, the US Centers for Disease Control and Prevention (CDC) through their Traveler Health branch, has been urging all travelers visiting Latin American and the Caribbean countries where Zika virus circulation has been confirmed, to take extra precautions against mosquito bites to avoid contracting the virus. On Friday January 22, CDC upgraded the warning for selected countries in Latin America and the Caribbean where locally acquired cases were confirmed to a Level 2 travel notice. This notification recommends special precautions for pregnant women, who are advised to consider postponing travel, and for women of childbearing age who are planning to become pregnant, who are advised to consult with their doctor before traveling, due to the probable association between Zika virus infection in pregnancy and adverse fetal outcomes. All travelers are urged to, as usual, strictly adhere to mosquito bite precautions. So how is CARPHA addressing the impact of Zika on tourism? Updated guidelines for Zika prevention in travelers and in hotels/guesthouses, for circulation in hotels and other tourism stay-over lodgings by CHTA and in cruise ships by CLIA (Cruise Line International Agency). Avoid storing water in outdoor containers that can collect water and become breeding sites. Cover water tanks or reservoirs so that mosquitoes do not get in. Uncover/unblock gutters and drains to release stagnant water.